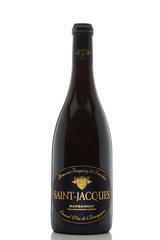 From the 2012 vintage in Burgundy, this Pinot Noir shows ripe red fruits, delicate oak and a lovely long length. Ready now and will cellar for 5 to 10 years. Marsannay being the most northern appellation of the Cote de Nuits sub-region of Burgundy often represents great value and this example from Saint Jacques is no exception. The wine takes its name from the fossilised scallop shells that are found in the limestone vineyards and is a natural partner for red meats and will also add a touch of perfection to full-flavoured cheeses such as Époisses or Munster.